A Prairie Rattlesnake, curled up in a weedy spot right next to the burrow of a prairie dog. I had never seen a rattlesnake before until 4 years ago. 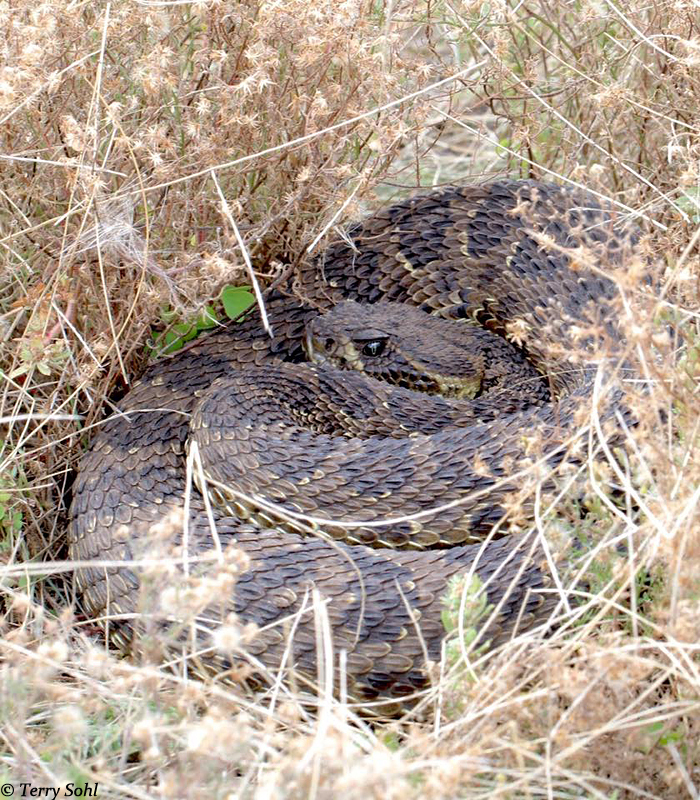 I knew Prairie Rattlesnakes were found in much of South Dakota, but not in the eastern part of the state where I live. 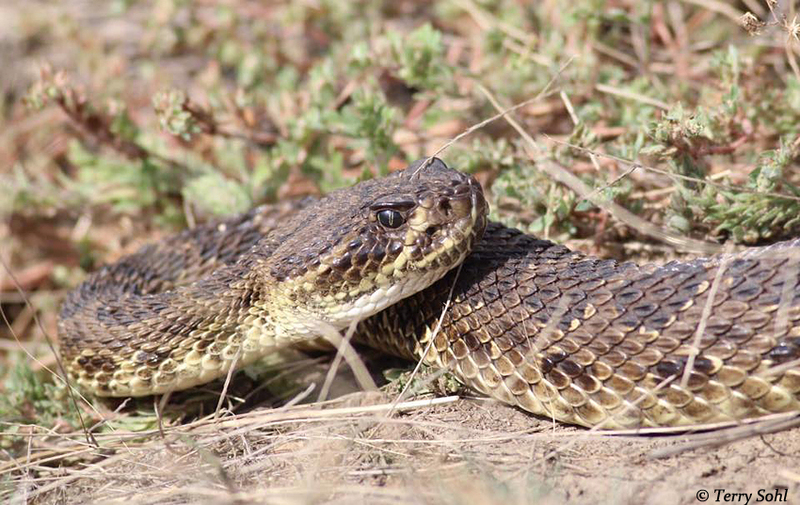 A fellow birder posted something that fall, about not only finding some nice birds on a prairie dog town (e.g., Sprague’s Pipits and Burrowing Owls), but also noted that after a cool fall night, there were rattlesnakes out sunning on that warm fall day. Rattlesnakes! An 8-year old son! What better father-son bonding activity than going “rattlesnakin’! !” I am SUCH a good father! First actually, we went fishing in the morning on the Missouri River, below Oahe Dam by Pierre. However by noon, with a nice warm sun starting to heat things up, we grabbed lunch and headed for that same prairie dog town. It didn’t take long to find sunning rattlesnakes. They hang out in prairie dog burrows (presumably abandoned ones), coming out to sun during warm fall days. On one prairie dog mound were 4 rattlesnakes, 3 quite large ones, and one very small one that couldn’t have been more than 12 inches long. Great fun had by all! Photos! A son that, well…wasn’t quite enamored as I was in seeing poisonous snakes up close and personal. Funny…my wife and sister also both gave me a bit of grief for PURPOSELY taking our son out to see poisonous snakes. Silly family…they don’t know good clean fun when they see it! Another Prairie Rattlesnake, and this guy was a big boy. Probably the biggest I’ve seen. I hadn’t been back out “rattlesnakin” again until this past week. No, I didn’t bring my son this time, but I did the same thing…fish during the cool morning hours, and then look for rattlesnakes as the sun warmed the ground at the prairie dog town. Rattlesnakes weren’t out in force like they were on that fall day of four years ago, but there were still a handful to be found, including probably the largest rattlesnake I’ve seen. So, if you’re sitting at home on a warm fall day, wondering where to have some good clean family fun, don’t forget! Rattlesnakin’….a family activity you ALL can enjoy! !